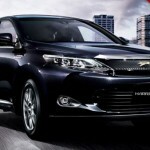 2015 Toyota Harrier is a new mid size crossover SUV car introduced by Japanese carmaker, Toyota. The Harrier SUV will have a distinctive exterior appearance with a wide range of exclusive accessories. The interior design of the car is slightly taken from the Lexus RS model. You can find many advanced features inside the car.